No Vacation Cabins at Cactus! If anyone is free tonight to attend an emergency neighborhood board meeting in Hawaii Kai, please consider showing up and offering support for a community effort to stop the proposed development of vacation cabins around our Makapuu flying site. The meeting is at Hahaione Elementary school at 7 pm tonight, Tuesday January 8. Sorry for the late notice. Further information is available from KHON, Hawaii Reporter and the Star-Bulletin. 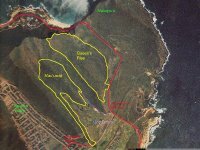 Check out the video on the KHON link - there's a paraglider kiting at Sandy's at the 42 second mark! I don't know if we should oppose the development. If they develop these sites, it might open up some S/E facing sites for us...? It also won't be anywhere near Cactus. They don't build houses on crumbling cliffs? Check the map again Pete. Cactus is in.